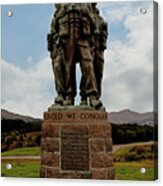 There are no comments for Commando Memorial 2. Click here to post the first comment. 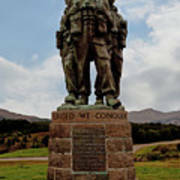 The monument consists of a cast bronze sculpture of three Commandos in characteristic dress complete with cap comforter, webbing and rifle, standing atop a stone plinth. 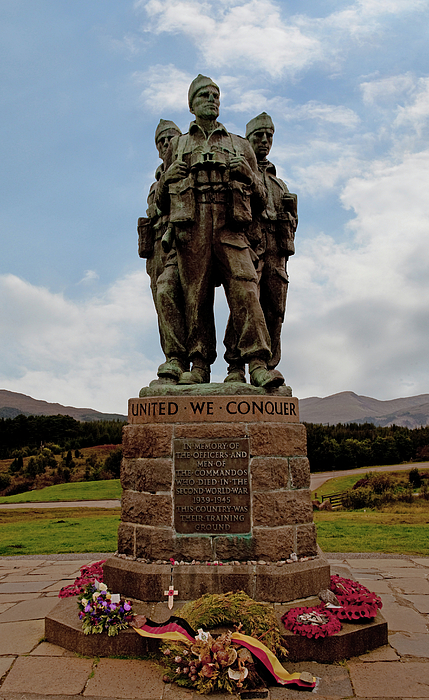 The three Commandos are depicted looking south towards Ben Nevis.The entire monument is 17 feet (5.2 m) tall. 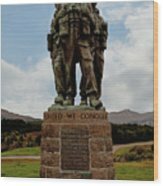 The monument has been variously described as a huge, striking and iconic statue. "United we conquer" is inscribed around the top of the stone plinth, while the original plaque on the stone plinth reads: "In memory of the officers and men of the commandos who died in the Second World War 1939–1945. 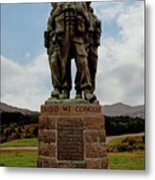 This country was their training ground.